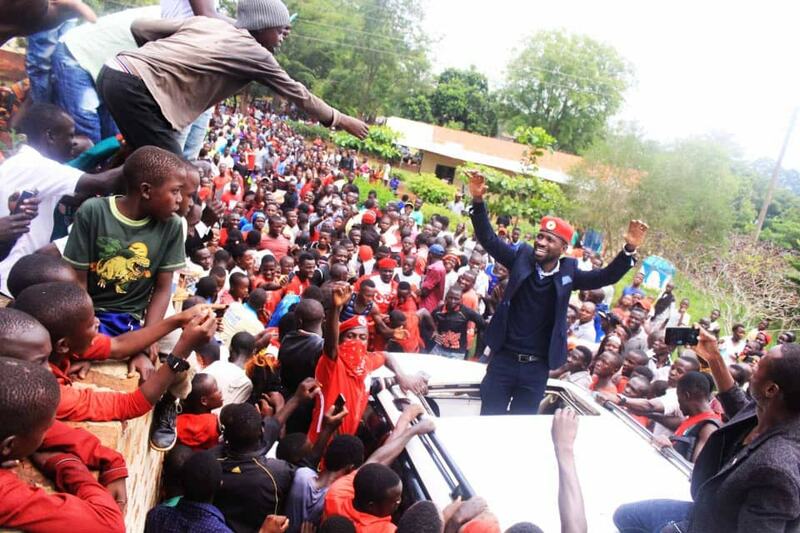 Kyadondo East MP Robert Kyagulanyi alias Bobi Wine arrives at Kangulumira Parish, Kayunga district Sunday before Police dispersed the crowd. KAYUNGA – The Catholic Youth Day celebrations in Kangulumira Parish, Kayunga district where Bobi Wine was chief guest ended in chaos on Sunday after police used teargas to disperse some of his supporters. The function started very well when the Kyadondo East MP, who was the chief guest, arrived at the function to the jubilation of Christians and other supporters in the area. Mass started normally and when time for speeches came, the musician-turned politician commended the people on unity. “In my address, I emphasized the message of unity, and called upon the young people to realise that God has given them an opportunity to make a contribution towards their country and they should make the best of it when they still have the opportunity,” Bobi Wine said. “I thank the parish priest Father Maurice Kigoye and all organisers for the invitation. I was very happy to see leaders from different political parties in attendance including the district NRM leadership. I was equally glad to see people from all religions coming together to celebrate with their catholic brothers and sisters. As I always say, what unites us as Ugandans is much bigger than what divides us. We are all Ugandans and that’s what matters most,” he added. However, while leaving the venue, he went in the open roof and waved to his fans, attracting the attention of police. In the process, teargas was fired, dispersing the residents. This attracted condemnation from Bobi Wine, who accused police of impunity. In the same vein, he accused police of blocking a festival by Galaxy FM’s ZzinaFest that was on Sunday set to be held at Bobi Wine’s One Love Beach, Busabala. “The police refused to clear the event, for the sole fact that the venue belongs to Kyagulanyi. This is not just an attack on me, but on everyone who would have earned a penny out of this show, and the many Ugandans who would have gathered to have a good time in their country. We shall certainly overcome all this,” he said. Last week, Bobi Wine was set to entertain his fans in Gulu Municipality at Smiling Panda on Sunday evening in his much-anticipated concert dubbed Kyarenga Extra. Police later denied blocking his music concerts organized in different parts of the country.